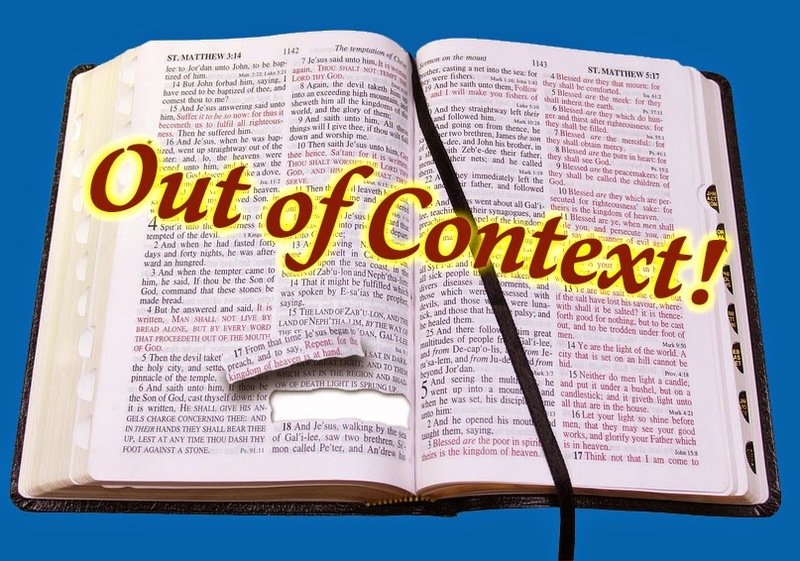 Exploring for Truth: God's Word shall not return void... - OUT OF CONTEXT SCRIPTURE! Time for another episode of...OUT OF CONTEXT. This one is probably pretty obvious to most people who know their Bible, but I am amazed at how many times I have still heard people throw this phrase out and attempt to use it in a manner that was never intended. The scenario usually goes something like this. A group has gathered in some evangelistic effort, and in the "pre-game" discussion, whether in prayer or just in the spirit of getting the juices flowing for action, the people are prompted to speak boldly, and are assured to have faith in whatever transpires, for they know that God's Word will not return void, but will accomplish something. So the thrust of what is being said here is that when the Lord says something, when he sends forth his word, when he sets forths his word to do something, it will be done and will in no way be thwarted or return unto him void. So while we can stand firm on a belief that the Word of God is indeed powerful, using this verse as some kind of blanket assurance or defense that no matter how we put God's Word out there, it will work, as is commonly done, is to offer false assurance and is a mishandling of Scripture. It just pays to stop and examine any such "pet" verses we may find always on the tip of our tongue. Take a quick look at the context of the Scripture, to make sure we are not using things out of context to say something we want, rather than what it is actually saying. This reminds me of a verse that a lady I work with always uses which also comes from Isaiah. It is Isaiah 53:5 "But he was wounded for our transgressions; he was crushed for our iniquities; upon him was the chastisement that brought us peace, and with his stripes we are healed." She is always speaking this verse on people who are sick or have some other physical need. I've tried to explain to her that the verse has noting to do with physical sickness and that it is speaking of God's promise to send a Messiah that would be the propitiation for our sins and heal "us" from being dead in sin. Then I always like to ask her who the "us" is. Of course she always gives me this crazy look when I try to explain to her who the elect are and what the Bible means when it speaks of election. Also last night I was watching American Vision: Basic Training for Understanding Bible Prophecy and Gary was saying how people use Hebrews 10:25 out of context which reads "not neglecting to meet together, as is the habit of some, but encouraging one another, and all the more as you see the Day drawing near." He was saying thant many people use this as a verse about going to church, which is how I've always heard it used. He was saying that this is not the case, but what the writer was trying to convey is the 1st century Christians as the children of God,(no longer Jew or Gentile) should come together as one when they saw "the Day" approaching. "The Day" being the final passing of the old covenant at the destruction of Jerusalem in 70AD. Essentially the writer was saying the old is passing away and there is not longer Jew or Gentile and "we" need to come together now since in the new covenant this division will no longer stand. I have been raised in a fundamental Baptist church and have been beaten up about church attendance with this verse Hebrews 10:25 This was a real eye opener for me. The Third Commandment: Abusing God's Name?